The Federal Reserve Bank – the central bank of the United States of America – announced last week that its benchmark interest rate would be increased from 0.75% per annum to 1.0% per annum. The increase is, according to financial market parlance, is by 25 basis points and in terms of Sri Lankan standards where the central bank interest rates are between 7.0% and 8.5%, may be insignificant. But for Americans, it is an increase of the prevailing interest rate by 33%. Since the benchmark interest rate is the rate at which depository institutions with the Federal Reserve Bank would lend their surplus moneys to others on an overnight basis without collateral, it is linked to all other interest rates in the US economy as well as the global rates like the London Interbank Offered Rate or LIBOR. Hence, an interest rate increase by the Federal Reserve Bank is a global event rather than a mere local event. This is the third time the Federal Reserve chose to increase its interest rate within the last 15 month period, the first being in December 2015 from 0.25% to 0.50% and the second, some three months ago from 0.50% to 0.75%. Two more interest rate increases, possibly in the amount of a quarter percent each, are expected in June and December this year. If they materialise, the benchmark Federal Reserve interest rates will go up to 1.5% indicating a doubling of the interest rates in that country within one year imposing far-reaching consequences on the rest of the world as well. When the US economy was hit by a major recession following the financial crisis of 2007/8, the Federal Reserve Bank started to stimulate the economy by pumping money to the country’s financial system and reducing interest rates to a near zero level. Accordingly, the monetary base – money printed by the US Federal Reserve and supplied to the market – rose sharply from $ 847 billion in January 2008 to $ 2100 billion in March 2010. This monetary base explosion continued since then in an unprecedented manner rising to a peak of $ 4149 billion by October 2014 and settling around $ 4000 billion since then. On 15 March 2017 on which date the Federal Reserve decided to increase its benchmark interest rate, the monetary base stood at $ 3929 billion, still a very high figure compared to its level prior to the financial crisis (available at: https://fred.stlouisfed.org/series/BASE). This was an extraordinary stimulation of the economy by using monetary policy. To reinforce this strategy, the Federal Reserve benchmark interest rate was reduced in a number of moves from 5.25% in mid 2007 to 0.25% in December 2008. It remained at this near zero level till December 2015 when it was increased to 0.5%; in two subsequent benchmark interest rate hikes in December 2016 and March 2017, the rate was increased to its current level of 0.1% (available at: https://www.thebalance.com/fed-funds-rate-history-highs-lows-3306135). The US quarterly real economic growth data since 2009 does not show that the economy has shown an appreciable recovery in response to the monetary policy stimulus package introduced by the Federal Reserve Bank. During 2005/6, before the economy was hit by the economic recession, the US economy grew in real terms at an average rate of 3.0% per quarter. During the recession from 2008 to 2009, the economy contracted on average by 1.52%. After the introduction of the stimulus package, the growth was, on average, only at 2.08% per quarter, much below its pre-recession performance. Hence, the US growth was a structural issue and without correcting it, attempting to stimulate the economy through monetary expansion does not appear to have worked in the US economy. Hence, from around 2015, the reversal of US monetary policy had been expected and its ripples had been felt in both the rich and poor countries. The countries which had specifically been adversely affected had been Sri Lanka, India, Thailand and Indonesia which had attracted US hot money into their respective economies by way of investments in local securities markets in search of better interest yields. This was because, along with the monetary stimulus package, the US interest rates fell sharply. The benchmark 10 year US Treasury securities rates fell from 4.76% as at January 2007 to 1.91% by January 2012. An unintended consequence of the interest rate decline in the US market was the flight of US savings out of the country in search of better interest return elsewhere. Sri Lanka which had faced a chronic balance of payments problem and depletion of foreign reserves quickly capitalised on these low interest rates and allowed foreigners to invest in government Treasury bills and Treasury bonds which had offered substantially higher rates than those prevailing in US markets. Accordingly, foreign funds flew into Sri Lanka and, by end February 2015, a total of $ 3.5 billion had been invested by foreigners in government securities. According to an announcement made by US Ambassador to Sri Lanka in February 2013, a bulk of these investments had been of US origin (available at: http://www.sundaytimes.lk/130210/columns/iran-style-economic-crisis-cwealth-summit-in-balance-32552.html). The total of such foreign funds in the government securities market amounted to nearly a half of the country’s foreign reserves of $ 7.2 billion as at end-January 2015. Hence, if the anticipated interest rate hike in the US economy would become a reality, Sri Lanka would be one of the casualties experiencing foreign exchange outflows from the country. This writer in an article published in March 2015, drew the attention of the Central Bank to the potential risks faced by a would-be capital outflow and emphasised on the necessity for tightening monetary policy to prevent a potential capital outflow (available at: http://www.ft.lk/2015/03/16/prof-lalith-samarakoon-as-us-interest-rates-rise-no-space-for-sri-lanka-to-wait-and-see/). This was not heeded to and the result was a sharp fall in the foreign investments in government securities over the previous two year period. The former Chairman of the Fed, Ben Bernanke, delivering the Josiah Stamp Memorial Oration at the London School of Economics in 2009, explained the rationale behind the Fed following a loose monetary policy known as quantitative easing or QE to stimulate the economy (available at: http://www.federalreserve.gov/newsevents/speech/bernanke20090113a.htm). According to him, the proximate reason for the financial crisis was the housing sector bubble that had developed in the US but it was an unintended consequence of the low interest rate policy pursued by his predecessor, Alan Greenspan. When the bubble burst in USA, it soon became a global crisis. The heavy toll it took in terms of loss of output, employment and wealth throughout the globe has therefore been substantial. Though the global economy was expected to recover on its own in due course, the timing and the speed of recovery were not to the liking of the world community. Therefore, the government’s intervention to accelerate the process was called for. Bernanke believed, as he explained in the Stamp oration, that the US Federal Reserve still had powerful tools at its disposal to help the US to come out of the financial crisis and economic downturn. The underlying assumption of this type of policy intervention by the Federal Reserve, and also by other central banks, is that central banks, or more specifically the central bank created-money, can boost economic growth. The reasoning goes as follows: Economic growth comes from the production of a bigger output and continued production of such a bigger output is dependent on the consumers’ ability to buy that output, on the one hand, and producers’ ability to produce more and more output, on the other. When central banks reduce interest rates artificially to low levels, it is believed that consumers make a hard choice in favour of consumption and producers in favour of investments. So, central banks seek to kill two birds with one stone by reducing interest rates. But the reduction of interest rates also leads to shrink the savings flows since people now get a low rate of return on their savings. When the savings flow declines, banks are unable to lend money to businesses despite the fall in interest rates. To increase the funds available for lending, central banks start printing money and supplying such money to financial institutions. It drives the interest rates further down and dries up savings flows further. Thus, central banks get caught in a vicious trap: They have to keep on pumping more and more central bank-printed money to the financial system in order to keep it alive. Thus, one mistake made by a central bank leads to the making of a series of mistakes. With this type of money creation, the US would have ended up with an uncontrollable hyperinflation but it had been saved by an unexpected market development. Banks which had already been hit once by the crisis had been cautious about lending and therefore had kept the new money in the form of excess liquidity temporarily deposited with the Federal Reserve. The result was a drastic reduction in money multiplier – the number of times a given unit of monetary base is increased by a bank in creating multiple deposits and credit. Thus, the US money multiplier which stood at 5 – meaning one dollar created by the Fed will eventually end up as 5 dollars – in 2008 fell to a level of less than 1 by end 2013. Thus, for the first time, the US monetary base has been bigger than its narrow money stock. It is a blessing in disguise since the Federal Reserve Bank’s quantitative easing has not led to monetary expansion and consequential high inflation. As a result, the US citizens now experience the historically lowest inflation which is below 1 percent. However, it has inflicted the US economy with a number of macroeconomic ailments: Low inflation, high trade deficit, low economic growth, high unemployment and pressure on the dollar to fall in the international markets. Thus, it appears that Bernanke, having tried to solve one problem, has created so many problems in the US economy. This was the ailment which his successor, Janet Yellen, inherited when she assumed duties as the Chairperson of the Federal Reserve Bank in February 2014. She has now started to reverse the trend by increasing interest rates. There has not been consistency in Sri Lanka’s monetary policy since early 2015. On the same day as the infamous Treasury bond issue, namely, 27 February 2015, the Central Bank did away with the lower interest of 5% it paid to banks and primary dealers if they had used the Bank’s standing deposit facility for more than three times a month. Since commercial banks had been using this facility liberally in view of the excess liquidity they had had at that time, the average standing deposit rate had been settled around 5% though the formal rate had been 6.5%. As such the abolition of the practice of paying a lower interest rate amounted to increasing the Bank’s effective standing deposit rate by about 1.5% percentage points. Thus, it was an unintended tightening of the monetary policy by the Bank. Then, making a U-turn in its policy, the Bank decided to reduce its policy interest rates by half a percent in April, 2015 bringing down its standing deposit rate to 6% and standing lending rate to 7.5%. Thus, the signal given to the market was that, despite the growing money and credit levels and potential risk of capital outflows, the Central Bank would loosen its monetary policy. However, in December 2015, confusing the market, this loose monetary policy was somewhat reversed by resorting to an inappropriate monetary policy measure, namely, the use of the statutory reserve ratio by increasing it from 6% to 7.5%. Thus, the market was totally confused about the intention of the Central Bank – whether it was following a tight monetary policy or a loose monetary policy. Creating such confusions in the minds of those in the market does not augur well for a central bank which is expected to give clear directions to the market. However, in 2016, in two separate moves, the Bank’s monetary policy was tightened: In February, by increasing the standing deposit rate to 6.5% and standing lending rate to 8.0% and in July further to 7% and 8.5%, respectively. But these measures were too short and too late. It also prompted the visiting IMF mission to flag Sri Lanka that its Central Bank should stand ready to tighten monetary policy if the money and credit levels would begin to rise. This is exactly what has now happened. The monetary base is now rising at the rate of 27%, up from 16.5% a year ago. The growth in broad money supply at the moment remains at a high level of 18% per annum. The credit to private sector has risen at an annual rate of 22%; the Central Bank’s lending to the government has skyrocketed recording an annual growth rate of 80% per annum. Meanwhile, the investments in government securities by foreigners have fallen from a peak of $ 3.5 billion in February 2015 to $ 1.2 billion as at the end of February, 2017. The freely available foreign reserves have fallen to a record low level of $ 4.7 billion as at the end of February, 2017 whereas the country’s debt repayment obligations during the next 12 month period have increased to $ 4.8 billion. The obvious corollary has been to exert pressure for the exchange rate to depreciate. Given this scenario, Sri Lanka cannot remain oblivious to the US monetary policy tightening. If Sri Lanka does not follow suit, the remaining foreign investments in government securities by foreigners amounting to $ 1.2 billion might also fly out of the country. That would be fatal to the Sri Lanka’s exchange rate. 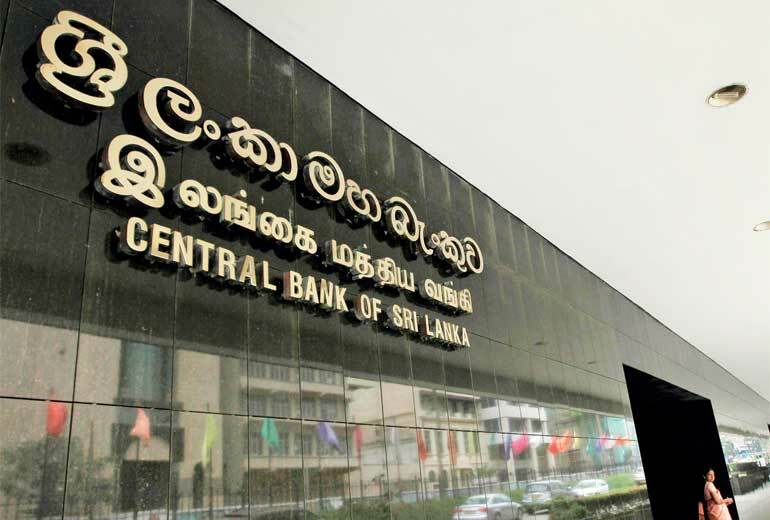 Thus, at the moment, Sri Lanka has not been left with an alternative, but to tighten monetary policy by way of an increase in Central Bank’s policy interest rates.